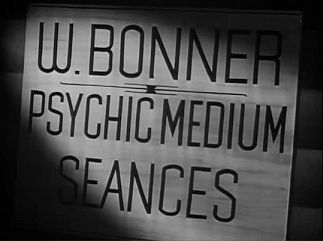 While holding a séance at his home, psychic William Bonner asks for questions from those present. After a voice asks, "What happened in London on the night of October 5th, 1935?" the lights are extinguished Bonner slumps forward. When the lights are restored, it becomes apparent that the psychic has been murdered. As Bonner's wife, Justine, summons Sgt. Matthews of the homicide bureau, Bonner's assistants, Tom and Vera Starkey, who operate from a hidden room, are panicky and wish to flee. Arriving on the scene, Matthews orders all of those present at the Bonner house, including, Justine Bonner, Harriet Green, Paul Hamlin, Charles Edwards, Nancy Wood, and Frances Chan, Charlie Chan's daughter, along with newly hired butler Birmingham Brown, to police headquarters for questioning. When the coroner notifies Matthews that the murder bullet cannot be found in Bonner's body, the inspector coerces Chan into joining the investigation, suggesting that he will have to hold his daughter, Frances, as a suspect. After studying the interviews with the suspects, Chan asks to speak with Nancy Woods, informing the inspector that she must be using an alias because the monogram on her purse reads "ND." A conversation with the hotel clerk reveals that Nancy's real name is Norma Duncan. When confronted with her lie, Norma claims that she had used the alias to infiltrate Bonner's séance and prove that the psychic had driven her father to commit suicide. Meanwhile, at the Bonner house, Mrs. Bonner communicates to Tom and Vera through an intercom that is linked to their hidden room. When Frances, who has come to visit Birmingham, overhears the conversation, she alerts her father. Hurrying to the house, Chan discovers the secret room hidden behind a cabinet in the seance room. 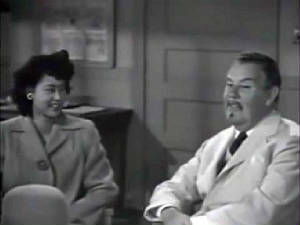 After reassembling the suspects at police headquarters, Chan reveals that Mr. Hamilton and Mrs. Green were both being blackmailed by Bonner, and that Mrs. Bonner had threatened to kill her husband because of his infidelity. Chan then asks if anyone can identify the speaker at the seance who has asked the question about London, however, no one offers any information. Later, Norma Duncan sends Chan a message asking him to come to her hotel, but when the detective enters her room, he finds her in a trance. Suddenly, the lights go out, a gun is fired, and the assailant runs out the door. Awakened from her trance, Norma is unable to remember what happened to her. Leaving Norma in the care of Rafferty, Matthew's assistant, Chan leaves to send a cable to Scotland Yard. Later, at the Bonner house, Frances and Birmingham overhear Mrs. Bonner asking her unseen assistants, Tom and Vera, for their help, and Frances decides to follow her. Following her to the Berkeley building, Frances meets her father and Inspector Matthews there and finds Mrs. Bonner's glove on the floor outside of an office door. Mrs. Bonner, in a trance, ascends the rooftop of the building across the street. Standing on the rooftop of the building, Mrs. Bonner hears a voice coaxing her to step over the edge. After she plunges to her death, Chan notices a peculiar stain on her coat, and takes it to be examined at a lab, where it discovered that the residue is that of a mind-altering drug that renders its victims helpless. Chan is then given several pills that contain the antidote to the drug. Announcing that Mrs. Bonner had committed suicide out of remorse for murdering her husband, Matthews declares the case closed. Dissatisfied with the sergeant's conclusion, Chan returns to search the room in front of which Mrs. Bonner's glove had been found. After entering the room, Chan is attacked, manacled, drugged, and hypnotized by an unseen assailant who orders him to climb to the rooftop of the adjacent building and jump. Having earlier swallowed one of the antidote pills (which has not yet taken effect), Chan proceeds, still under the influence of the drug and hypnotic suggestion, to the other building and ascends to the roof. Meanwhile, becoming concerned when she is unable to locate her father, Frances notifies Rafferty. Together they hurry to the Berkeley building where they find that Chan has gone to the building across the street. As they see Chan tottering on the ledge of the roof, the antidote suddenly begins to work and he comes out of his trance just as Rafferty and Frances are about to grab hold of him. When Rafferty hands Chan the response from Scotland Yard, Chan reconvenes a seance at the Bonner house. That night, Chan exposes Tom and Vera and their secret room and then challenges the séance participants to answer a series of word association questions. Suddenly, the lights go out and a silent shot is fired. As the lights are turned back on, a small hole can be seen in the back of the chair in which Chan had been seated, the detective having moved during the blackout. Chan then produces the cable from Scotland Yard imparting the information that on October 5, 1935, Chardo the Great, a well-known magician, had been gravely injured in an automobile accident. The detective continues, stating that Chardo's wife, Justine, had run away with his assistant, Bonner. After undergoing plastic surgery to alter his appearance, Chardo was determined to make Justine and Bonner pay for their betrayal. Blood is seen to be dripping from the hole in the chair that had been occupied by Chan, to which the detective deduces that a similar bullet, made of frozen blood, was used to kill William Bonner, thus explaining why no bullet was found in Bonner's body. Addressing Hamlin as Chardo, Chan seizes the cigar case which contains the hidden spring gun that was used to kill Bonner. NOTES: The working titles of this film were Murder Chamber and Charlie Chan in the Murder Chamber. 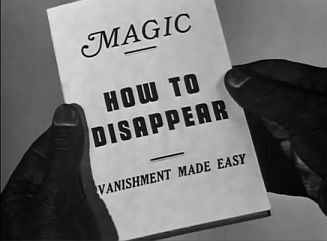 It was also reviewed as Charlie Chan in Black Magic. The film was later reissued as Meeting at Midnight, probably so as to avoid confusion following the 1949 release of the Orson Wells film also titled Black Magic. Although a Hollywood Reporter news item lists Trevor Bardette in the cast, his participation in the completed film has not been confirmed. Shady business do not make for sunny life. New toot out of old horn. Spirits always have very long way to come. (Frances: "Oh, Pop! You say I have brains, then you make me sit around and twiddle my thumbs!") Twiddling thumbs at hotel keep pretty nose out of trouble. (Frances: "Wait till the folks back home see me - I'll knock their eyes out.") You are, perhaps, pugilist? (Frances: "I bought a crownless hat, and a backless dress, and some toeless shoes.") Stores have no clothes which are complete? (Frances: "You know, Pop, I got an idea about this Bonner case.") Water on brain now leaking, huh? PROBABLE DATE: Spring 1944, probably late March to mid-April, as Mr. Johnson tells Birmingham Brown that the moaning they are hearing is probably someone "moaning about their income tax." CHARLES EDWARDS' "PET NAME" FOR HIS LATE WIFE: "Gert"
THE QUESTION ASKED BY THE VOICE DURING THE SEANCE: "What happened in London the night of October 5th, 1935?" THE ADDRESS OF THE BONNER HOUSE ACCORDING TO SGT. MATTHEWS: "349 Dexter Street." THE HOMICIDE OFFICERS AS REQUESTED BY SGT. MATTHEWS: "...Smith and McCarthy." SOME OF THE TOYS THAT CHARLIE CHAN WAS PACKING TO TAKE TO HONOLULU TO HIS CHILDREN: Dancing puppet, toy bear, stuffed cloth doll, Mexican jumping beans, noise maker. CHARLIE CHAN'S TRAVEL PLANS: "I am leaving tomorrow for Hawaii..."
THE REASON FOR CHARLIE CHAN'S PLANNED TRIP TO VISIT HIS FAMILY IN HONOLULU: "Am on brief vacation from government work." ACCORDING TO SGT. MATTHEWS, THE NUMBER OF MURDER CASES THAT BIRMINGHAM BROWN HAD BEEN INVOLVED THUS FAR: "...three murder cases already." THE NAME AND INFORMATION AS PROVIDED BY NANCY DUNCAN REGARDING HER LATE FATHER: "My father was Charles Duncan, a civil engineer." INFORMATION AS ADDED BY SGT. MATTHEWS REGARDING NANCY DUNCAN'S LATE FATHER: "He committed suicide a year ago." MR. DAWSON'S DESCRIPTION OF THE EFFECTS OF MENASGEROL: "It's a derivitive of of the powerful shock drug." ACCORDING TO MR. DAWSON, THE EFFECTS OF MENASGEROL: "A few minutes after taking it, there would seem to be no effects whatever. But, actually, the drug leaves a person with no mental or physical resistance." ACCORDING TO MR. DAWSON, THE LENGTH OF TIME NEEDED FOR THE ANTIDOTE TO MENASGEROL TO TAKE EFFECT: "...10 to 15 minutes." THE TIME ON CHARLIE CHAN'S WATCH WHEN HE WAS HYPNOTIZED: 10:14 a.m. 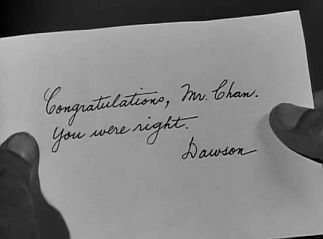 THE APPROXIMATE TIME THAT RAFFERTY AND FRANCES CHAN NOTE THAT CHARLIE CHAN had been in mrs. bonner's office: 10:30 a.m.
Chan: (to Norma Duncan) "Bonner." Chan: (to Norma Duncan) "Revenge?" 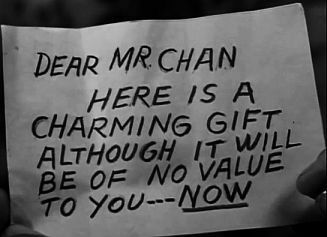 Chan: (to Paul Hamlin) "Magician." Chan: (to Paul Hamlin) "October." Chan: (to Harriett Green) "Bullet." Chan: (to Harriett Green) "London." Chan: (to Norma Duncan) "1935." Chan: (to Paul Hamlin) "London." Chan: (to Charles Edwards) "Cigar." Chan: (to Charles Edwards) "Case." Charlie Chan: "Cablegram report from Scotland Yard." dime novel - A melodramatic novel of romance or adventure, usually in paperback. Sgt. Matthews: "That's dime novel stuff." dry up - (Informal) Cease talking. Black magic/Meeting at Midnight - Tom Starkey: "Now, dry up on the dramatics!" gremlins - (1) Imaginary gnomelike creatures to whom mechanical problems, especially in aircraft, are attributed. (2) Makers of mischief. Birmingham Brown: "I got gremlins gallopin' up and down my spine." Shattuck Hotel - A landmark hotel located in Berkeley, California, that opened in 1910. Black Magic/Meeting at Midnight - Frances Chan (answering Sgt. Matthews at to where her father is staying): "At the Shattuck Hotel."